"Pino errante sobre la Tierra!" 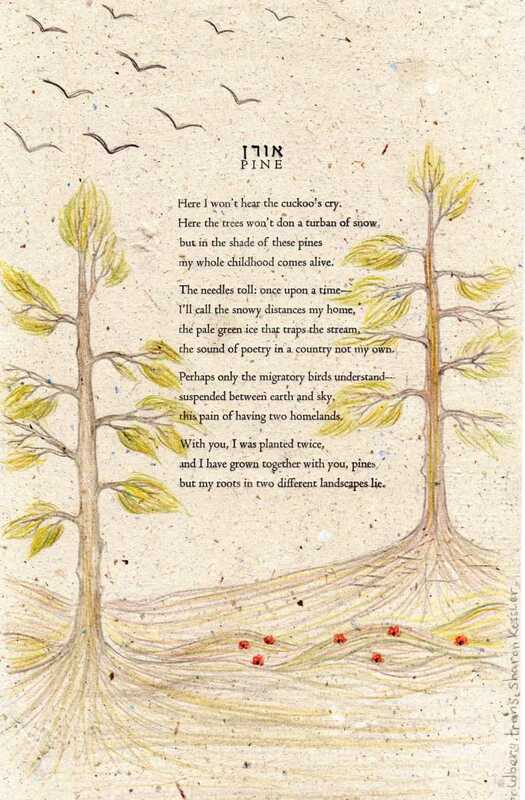 The 12 years I spent translating Lea Goldberg began with a song on the radio: when I first heard Achinoam Nini's Hebrew-English version of "Pine," I recognized it as the first Hebrew poem I had ever learned, in a bad translation, back when I was 18 and could not yet read the original. I had not thought about the poem in many years, and I was completely taken by Nini's version. The simple, resonant surface of the poem belies a depth of wisdom, and this characterizes so much of Goldberg's work. For me "Pine" is the quintessential immigration poem. And so I was driven to translate it, and once I had, I couldn't stop. I translated Lea Goldberg's poetry in almost complete isolation for 10 years, speaking of it only to a handful of friends. Finally, in 2005, the manuscript-in-progress was a awarded a Witter Bynner Poetry Translator Residency at the Santa Fe Art Institute, where I spent a month finishing the translation. The full manuscript is still seeking a publisher. A small chapbook of the "Trees" sequence, including the poem "Pine," was the first book I type-set and printed at Fish-Eye Press. Here you can see the broadside version of "Pine," printed on paper made at the press and illustrated in colored pencil by Noga Farchi. You can click here to see my translation of another Hebrew poem, this one by the poet Rachel Uziel Farchi (1937-2009).